President Muhammadu Buhari on Tuesday in Abuja commended the Guards Brigade for demonstrating a high-level of discipline and professionalism expected from officers and men of the Nigerian Army. 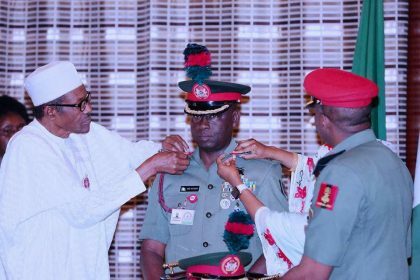 Speaking at the decoration ceremony of the Commander, Guards Brigade, Brig-Gen. Musa Yusuf as Major-General, President Buhari said it was instructive that the senior officer displayed a high level of discipline during his two-year stint as Commander. ‘‘I congratulate the Brigade Commander for his achievements these past two years. ‘‘I never received any serious report of indiscipline in your formation that is in-charge of my security. ‘‘I hope you will get a command that will complement your experiences in the political headquarters. ‘‘I congratulate you very much for making it to this new rank at a very competitive time. I know there are so many Generals but when you go to the records you pick the best and place them at very strategic appointments,’’ he said. The President expressed confidence that Major General Yusuf will bring his experience in the field as a former Guards Brigade Commander to his next posting, as directed by the Defence headquarters. Recounting his days as a military officer, President Buhari said officers earned the respect of their colleagues because of their intellectual disposition and experience in the field. ‘‘An officer is what he is when he gets into the field. Certainly, there was the need for intellectual officers but then what you do in the field is what earns you respect from those who are under you,’’ he said. In his remarks, Yusuf while reaffirming his “unalloyed loyalty and that of his troops to the President and Commander-in-Chief,’’ thanked President Buhari for the honour of decorating him with his new rank. He conveyed the appreciation of his troops in Keffi, Nasarawa State and those at Gwagwalada, in the Federal Capital Territory to the President for the renovation works in the barracks. In Keffi, this is the first time in the last 25 years that 14 blocks of accommodation for soldiers are being renovated; he said adding that in Gwagwalada, the Chief of Army Staff approved funds for renovation works in the barracks to make it habitable. Born on November 6, 1966, Major General Yusuf had served as a member of Nigerian contingent to UN peacekeeping missions abroad including United Nations Mission in Eritrea-Ethiopia (UNMEE) and United Nations Mission in Sudan (UNAMID). He also served in ECOMOG and Operation Harmony in Bakassi, among several other appointments in army units and formations in the country. A graduate of Chemistry from the Nigeria Defence Academy, he holds Master’s Degree in Transport Management and additional Master’s Degree in Strategic Studies.